In its second journey of "touching" the sun, the NASA solar probe, roughly the size of a small car, that launched almost eight months ago from Cape Canaveral Air Force Station, will once again face the perilous dangers of our star when it reaches its second closest approach on April 4. 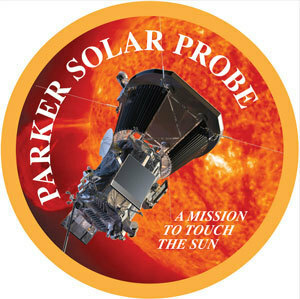 Named after the American solar astrophysicist Eugene Parker, who developed the theory of solar winds — the constant flow of charged particles released from the sun that spreads throughout the entire solar system — the Parker Solar Probe is NASA's ambitious mission in understanding the sun. Launched in August 2018 from Launch Complex 37, the $1.5 billion probe blasted atop a United Launch Alliance's 233-foot Delta IV Heavy rocket and reached its first closest approach a few months later in November. As humanity's first visit to not just the sun, but to any star, this historic mission aims to unlock the mysteries the giant ball of gas currently hosting a spot at the center of our solar system contains. "It's going to help us be able to predict solar flares," NASA administrator Jim Bridenstine said last week at a congressional subcommittee in Washington, D.C. "It's going to help us predict coronal mass ejections potentially that could be very damaging to astronauts in deep space as we return to the moon and eventually go on to Mars. So we need to be able to predict those to protect human life into the future." Hurtling at a speed of about 213,200 miles per hour, the zooming spacecraft will reach a perihelion (when it's closest to the sun) roughly 15 million miles away from the sun's surface at 6:40 p.m. EST on Thursday, the same distance during its first approach, NASA spokesman Geoff Brown told FLORIDA TODAY. The spacecraft broke the record for closest approach to the sun, previously set by the Helios 2 spacecraft in 1976, which came within 27 million miles from the sun's surface, during its initial flyby back in November. 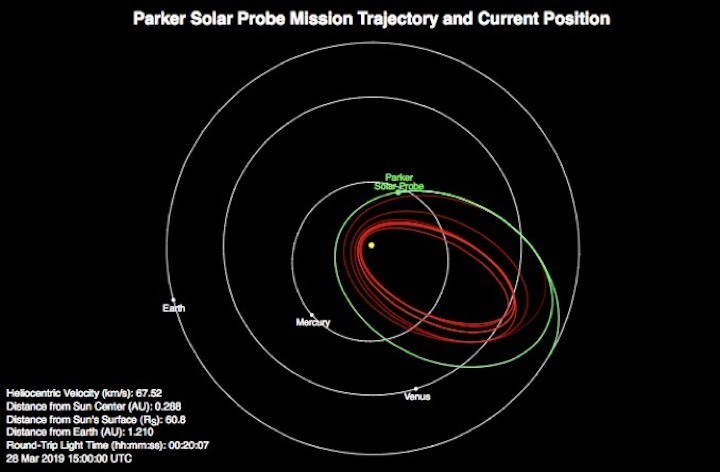 Intended to be a seven-year mission, the last three of the 24 planned orbits around the sun will have the probe flying at a speed of about 430,000 miles per hour. For comparison, it would only take one second to get from Philadelphia to Washington D.C. at that speed, according to NASA. It will also face an overbearing temperature of 2,500 degrees Fahrenheit when it gets within 3.8 million miles of the sun's surface during those last three orbits. That's about a tenth as close as Mercury, which is about 36 million miles away from the sun on average. After its last journey around the sun, at which point the probe will be in a stable orbit, the spacecraft will begin to disintegrate once its heat shield can no longer provide protection, Brown said. During perihelion, which lasts until April 10, the spacecraft's four suites of science instruments will be fully operational, storing scientific data collected from within the sun's corona — the outermost part of the sun's atmosphere. The four instruments are designed to study the sun's magnetic fields, plasma and energetic particles as well as imaging the solar wind, according to the agency. In order to withstand the brutally hot temperature the sun will be shedding on the spacecraft, the probe is shielded by a 4.5-inch-thick carbon composite foam Thermal Protection System, keeping the spacecraft's body at a comfortable state of only 85 degrees Fahrenheit. Once closest approach occurs, the probe will go silent for several days so it can focus on not melting, but will start transmitting data back to Earth over a period of several weeks later this spring. In December, the probe will perform its second of seven Venus gravity assists, needed to bring the spacecraft's orbit closer to the sun. This mission will hopefully give scientists the information needed to trace how energy and heat move throughout the sun's corona and to understand what causes solar wind and the solar energetic particles to accelerate, according to NASA. Since completing its first orbit back in January, scientists have already downloaded over 17 gigabits of science data and will have the complete dataset fully downloaded by April. Studying the sun will also help scientists learn more about other stars in the universe, how life developed on Earth as well as learning more about space weather, an event that occurs when disturbances in solar wind shakes Earth's magnetic field and pumps energy into radiation belts, according to NASA. Knowing more about it and more importantly, how to predict it, will allow scientists to figure out how to protect many of the satellites humans depend on that are threatened by space weather. "The solar wind also fills up much of the solar system, dominating the space environment far past Earth," according to NASA. "As we send spacecraft and astronauts further and further from home, we must understand this space environment just as early seafarers needed to understand the ocean." PSP passed through the outermost layers of the Sun’s atmosphere, the corona, at 213,000 mph, coming within 15 million miles of the Sun itself. Closest approach, called perihelion, occurred at 6:40 p.m. EDT. PSP began this phase of the mission back on March 30, 2019, and it will last until April 10. All four suites of scientific instruments are currently operational and will collect science data from within the Sun’s corona as the probe passes through. Due to its close proximity however, PSP has been out of radio contact with Earth since March 30, since it must keep its heat shield oriented toward the Sun during the encounter. After this mission phase is completed, it will resume contact and send the data back to Earth over several weeks, as it did during the first close approach. PSP has been designed specifically to withstand the searing temperatures and powerful gravity it experiences from being so close to the Sun. This second close approach will pass the Sun at about the same distance as its first approach; the previous distance record was held by the Helios 2 probe, at about 27 million miles from the Sun, in 1976. On Dec. 26, 2019, PSP will use a Venus gravity assist – the second of seven – to put it on a trajectory for even closer passes of the Sun. PSP will perform 24 close passes of the Sun in total, each one closer than the one before. The first Venus gravity assist was on Oct. 3, 2018. The third close flyby is scheduled for Sept. 1, 2019. 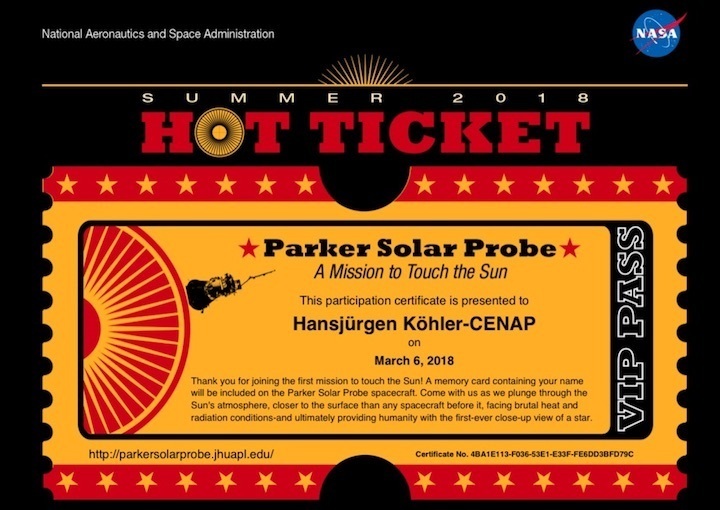 In 2025, at the end of the mission, PSP will pass through the Sun’s corona, only 3.83 million miles from the surface of the Sun, enduring temperatures nearing 2,500 F.
PSP’s mission is basically to find out how the Sun works and find answers to some long-standing questions, such as how the solar wind accelerates particles, and why the Sun’s corona is so much hotter than its surface even though it is much further away.